A cancer diagnosis changes everything: work, relationships with family and friends, one’s perspective on what makes a good or bad day. Jim Higley didn’t expect the summer after his own diagnosis and subsequent surgery to be the best one he ever had, but that’s what it was. Even though he was in pain, even though physical activities that he once accomplished automatically now required resting, planning and slowness, Higley had never felt more in the moment. He realized that his life had been on autopilot, and it took a deadly disease to flick the switch and return him to the present. Most readers know what autopilot feels like. We go to work, come home, process dinner, tend to children, watch T.V., go to bed, and do the same things the next day. Higley describes this as being a bobblehead–one of those figurines with a springy neck who nod ad infinitum at whatever they’re facing. Higley knew he was going through the motions, and when all of a sudden his days took on a precise hue of finitude, he stopped his bobbleheading and started paying attention to the people he loved so much. Higley grew up the youngest of five brothers in a family that revolved around their mother. She fed, taught, gardened with, and talked to them. When she died of brain cancer after only a couple weeks of illness, the family–especially Higley and his father, the only ones still living at home–was traumatized. Higley slipped naturally into the role of caregiving, in many ways taking his mother’s place. When the author himself got sick, he had to relinquish that role and let people take care of him, which was difficult, but not impossible. With grace and not a little humor he explores what it’s like to suddenly be the patient, to be taken care of by his children, to be more invested in his life than he been for years. Higley writes with a sweet, sincere humility. He doesn’t wallow in medical details but explores his disease in its role as a jumping off point; it provides him the opportunity to more deeply delve into what he learned from childhood, from his brothers, his parents, his children, and his friends. Reconnecting with the details of his life is his most important mission and he relates his various awakenings with a gleeful tone that sounds an awful like innocence. Higley sums up the lessons of each chapter on the last page and also includes probing questions that readers may feel inspired to apply to themselves. 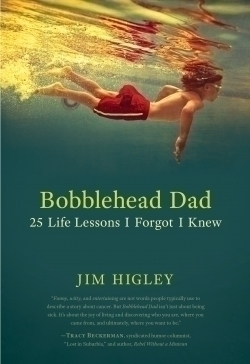 Readers will embrace, mourn, delight in and admire what Bobblehead Dad has to offer. Not knowing whether he’ll live one year or fifty, Higley makes the present count for everything. There’s much to learn from his particular brand of survival.